November Roundup: What Does Leadership Mean to Quality? Leadership. If you work in any kind of business, you’ve probably heard a lot about it. It’s now accepted wisdom that we need leaders in the workplace. Are quality professionals leaders? How do we make them better leaders? That was ASQ’s topic for discussion in November. 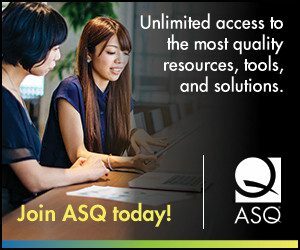 ASQ bloggers had interestingly diverse opinions on this topic. Some called for more quality training. Others said that being leader isn’t everyone. For more, see below. And Dan Zrymiak writes that a different vision of leadership is now required for the quality field, going from control to transformation. Babette Ten Haken writes that quality leadership takes guts and risk-taking. How should leaders lead? Manu Vora offers a refresher on leadership basics, and new Influential Voices blogger Luciana Paulise compiles her leadership advice. Jimena Calfa gives a reminder on the difference between leadership and management. Bob Mitchell writes about the role of transformational leadership. And Edwin Garro says we must find the leader within ourselves before we can absorb leadership training. Leadership in action: Lotto Lai writes about Steve Jobs’ leadership at Apple. New Influential Voices blogger Sunil Kaushik shares examples of out-of-the-box leadership. Do we really need leaders? Some choose to follow and do it well. Guy Wallace discusses those who don’t want to be leaders–what is their role? Michael Noble is also skeptical about the idea of leadership for all. And Jennifer Stepniowski wonders if quality professionals first need to be better communicators. Next Next post: December Roundup: What Does Ambition Look Like in Quality?